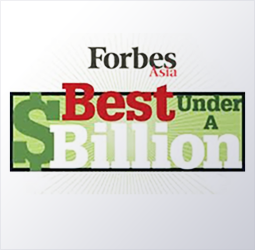 2015-11-30 King Slide Works Co., Ltd. is honored to be listed in Asia's 200 Best Under A Billion' enterprises in 2015 by the most influential business magazine, Forbes. King Slide Works Co., Ltd. is honored to be listed in Asia's 200 Best Under A Billion' enterprises in 2015 by the most influential business magazine, Forbes. In 2015, Forbes Asia evaluated approximately 17,000 small-medium enterprises with annual sales revenue of less than a billion US dollars in the Asia Pacific. The evaluation was carried out through weighted scoring of the companies' annual turnover, profit, shareholders equity, return on investment and market value etc. King Slide Works Co., Ltd.'s exceptional performance on every assessment factor has contributed to our attainment of such honor. Ever since the establishment of King Slide Works in 1986, innovation and research and development on more user-friendly, convenient and safer mechanical designs have been the company's core objective, providing our customers with the highest quality products and total solution experiences. After many years of research and development from our prime manufacturing base in Taiwan, King Slide has successfully expanded its market worldwide and the brand is now recognized globally. It is King Slide's honor to have been accredited such honor by a highly prestigious news media. We will continue to innovate, advance and develop beyond our boundaries by means of providing the highest quality products and services to our customers while generating steady growth and profit in return for our investors.